October 2005... The end of an era? Winter is drawing in and the show season is in hibernation. I started to think whether or not I wanted to continue to modify the Saxo, or whether it was time to archive all of my memories and move on? After thinking long and hard, I decided that I'd invested too much time and effort into modifying my Saxo to call it a day. I realised however that sometimes I wasn't able to enjoy the car as much as I should. After all this was my daily driver and if it broke it caused me a hassle getting to work and back with no car. So, the decision was made... The VTS would live on, but it would do so as a fun, track car, rather than a daily driver! I wasted no time in finding a second car... a well looked after Saxo VTR, owned by Scott McEachern. The new daily driver had arrived! I now felt more inclined to work on the VTS, as I didnt have to have it back in road worthy condition for the next morning. For a couple of months (well, since FCS back in May if I'm honest) I'd had a problem with my drivers side front brake disc. It seemed to be binding, and getting a little hot/smelly. 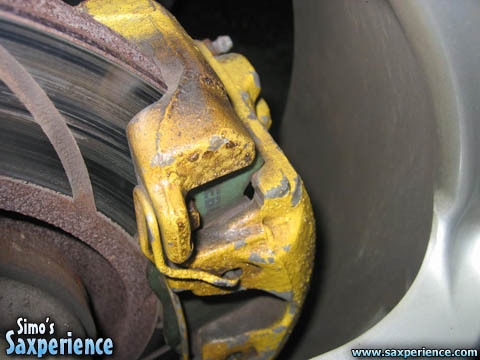 I fitted new brake discs and pads, but that hadn't cured the problem... it must have been a problem with the caliper sticking. One evening, whilst driving to Suie's house, I got stuck at a set of traffic lights. I'd just been blatting down the expressway before being stopped. A few lads stood at the traffic lights started to point... strange I thought? A few minutes later I arrived at Suie's house, got out and locked the car... I was greeted with a red glowing brake disc! No wonder people were pointing! I had recently bought a pair of VTS front suspension struts from Ebay, which still had the original brake discs/calipers attached. One weekend, I fitted my spare caliper and bled the brake fluid before testing the car on the road... it was much improved! I'd gradually got used to the car slowing down itself when not in gear. I could now set off from traffic lights a little easier too! Lesson learnt - don't be lazy when it comes to maintaining your car!